Grab the Smart Gold Double Deal promo before it runs out! Smart Communications, Inc. (Smart) brings back their 'Double Deal' promo available at Smart Wireless Centers nationwide until February 28, 2011. Sorry for posting this just now, but you still have 4 full days to go and get yourself a a brand new Smart Gold postpaid plan. What exactly is with Smart Gold’s ‘Double Deal’ offer? In a nutshell, all approved postpaid subscribers will receive an extra mobile phone or a netbook with their postpaid plan, absolutely free – on top of the free handset which already comes with the plan. “This is one of the advantages of being on Smart Gold – our subscribers not only enjoy the ‘nationwidest’ network and the clearest signal, they also enjoy the best, most powerful devices that suit their needs and lifestyles,” shared Tricia Dizon, department head of Smart Gold and Buddy. 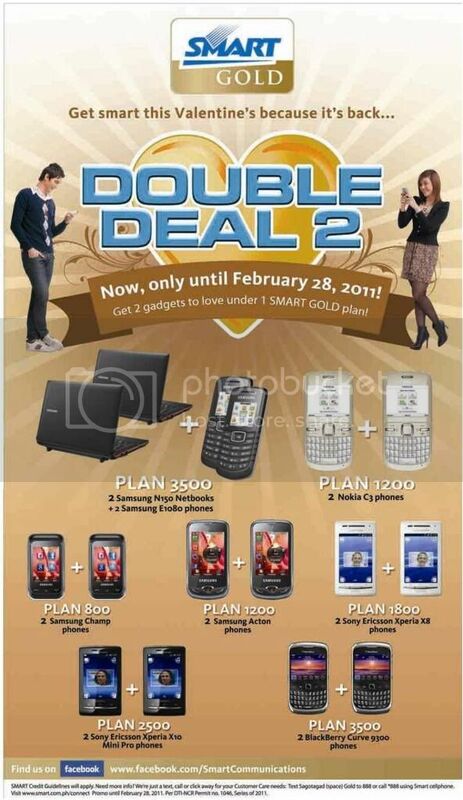 For more details, please visit http://smart.com.ph/gold/promos/DoubleDeal1.htm.